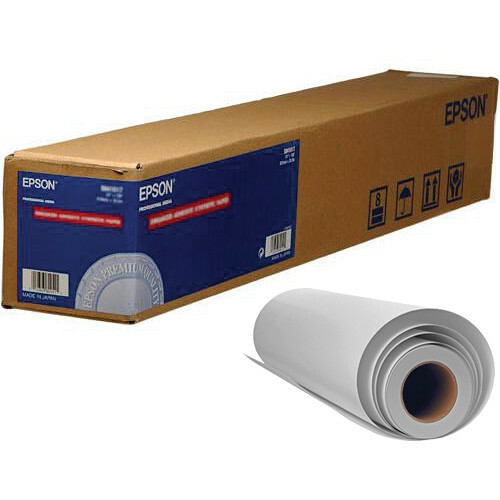 The 24" x 40' roll of Epson Glossy Exhibition Canvas Archival Inkjet Paper features a 420 g/m2 media weight and a 22 mil thickness that are ideal for professional and artistic prints. This cotton-poly blended canvas features elastic polymers that provide the high tensile strength necessary for gallery wrap stretching without cracking. Box Dimensions (LxWxH) 26.1 x 6.5 x 6.35"
Glossy Exhibition Canvas Archival Inkjet Paper (24" x 40' Roll) is rated 5.0 out of 5 by 2. Rated 5 out of 5 by Anonymous from Heavy Canvas We use this product to print out portraits and stretch onto stretcher bars. The canvas and image hold up perfectly when stretched. No cracking or distortion when tightened over the bars. Color and finish are very good. Once dry for 48 hours the finish is durable without having to spray.